Henry Hazlitt is the author of the book Economics in One Lesson. 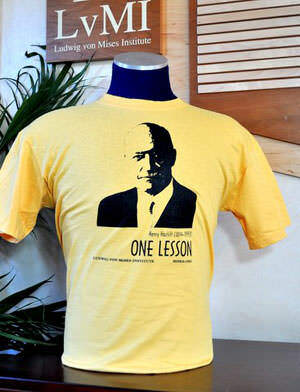 This T-shirt celebrates his book and overall contribution to economics. After all, this man might have taught more people the fundamentals of economic thinking than anyone else in a half century. 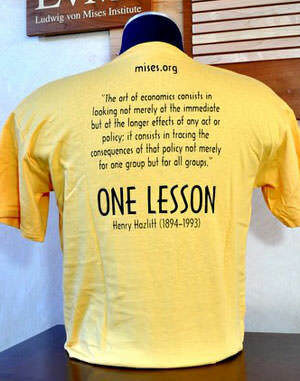 This special edition T-shirt in gold (Hazlitt favored the gold standard) includes printing on the reverse side, with the One Lesson that Hazlitt taught: "The art of economics consists in looking not merely at the immediate but at the longer effects of any act or policy; it consists in tracing the consequences of that policy not merely for one group but for all groups." No one can miss it! How pleased Hazlitt would have been with this shirt. This shirt has been one of the most coveted in the entire Austrian economics milieu. T-shirt dedicated to the life and work of the great Carl Menger, founder of the Austrian School. This bibliography contains more than 6,000 entries, with books annotated by Murray N. Rothbard. 15 thinkers who made the greatest contribution to advancing the Austrian School of economics. In this 1969 work, Henry Hazlitt explains why politicians who promise salvation through government are dangerous. It's incredible that this 1916 tutorial on how to think, by none other than Henry Hazlitt, would still hold up after all these years.